If you liked today’s show, please subscribe on iTunes to the Actionable Content Marketing podcast! The podcast is also available on SoundCloud and Stitcher. Nathan: Have you ever wondered how you can create amazing content faster? What if you just did more of the right things right now to build a loyal audience as you learn and grow? Hey, I’m Nathan from CoSchedule. In this episode of the Actionable Content Marketing Podcast, I’m chatting with our CEO and co-founder at CoSchedule Garrett Moon. Garrett is the guy who keeps all of us cruising on the right projects. He’s the one who helps us work smarter as we work more effectively. Just listen to this conversation to learn how you can publish content quickly, learn from your success and mistakes, and improve everything you do. 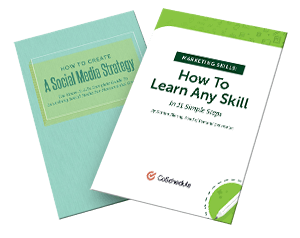 Prepare to learn our secrets of hacking your marketing, let’s do this. Alright Garrett, I think this topic of marketing for a start-up or like to startup is really going to be different for a lot of marketers out there. I don’t want to give anything away yet but I’m really excited this will be a very unique conversation. Garrett: Well good, I hope so. It’s kind of a passion subject of my I guess to combine start-ups and marketing and all the strategy to connect those two things. Can’t wait to have the conversation. Nathan: Yeah, perfect. Garrett I know that a lot of people know us by CoSchedule, I just want to hear from the horse’s mouth, could you give me the lowdown on what CoSchedule is? Garrett: Well, sure. I’m Garrett Moon, I’m the CEO and one of the co-founders here at CoSchedule. We are a marketing calendar that allows teams to schedule content marketing and social media marketing and really any marketing project that they’re working on on a single calendar that gives their team a bird’s eye view and keeps them more organized. Nathan: Excellent. Just for the folks who may not know who you are exactly what you do as the CEO, co-founder role, what do you do here? Garrett: It changes a lot. I think one of things of the CEO is sort of figuring out what is the most pressing need of the company or area, biggest problems that we need to solve. I get to tackle the hardest problems of the company all the time. A lot of strategy stuff, I work a lot with marketing success teams and still very involved in the products team. It really depends but if nothing else, maybe they can just think of me as the guy who sends them all those emails. Nathan: Yeah, exactly. I guess I get that too. I send a lot of emails myself. Nathan: Just to kick this off, we’re going to talk about marketing startup and you’ve used the words content hacking and marketing hacking. Can you just give me a quick overview of what you mean by that? Garrett: Yes. Hacking is a sort this startup term and it’s kind of the idea. You going to start a new startup or technology based startup and a bunch of engineers go into a dark room and they hack some code together and at the end of it comes out this magical product that customers buy. Startups have leveraged that term and that concept. They’ve apply it to marketing. There’s a term out there called Growth Hacking which is about these “hacks” that you can do that will make your product grow very, very quickly and very fast. I think the way I always have thought about it is that at CoSchedule we’ve always really focused on building a really strong inbound marketing process, a really strong content marketing funnel. Some of the tricks that we’ve used to grow that audience and to make that funnel really work well, we kind of have combined into this concept of content hacking or hacking your content marketing. Nathan: Yeah and all that makes perfect sense. For the rest of this conversation, you’re going to walk us through three different hacks that we’ve used at CoSchedule and what exactly that means for different marketers and how they can implement this stuff themselves. Garrett: I think one of the things that I always look at where maybe it’s a little bit different from like your growth hacking conversations. I think growth hacking a lot of times focuses on just tactics, like just the individual things that you might do or tricks. I think we’ll definitely cover some of those but I think a lot of times when it comes to marketing, hacking your marketing is actually more about painting a different mindset and thinking a little bit differently in terms of how you’re approaching your marketing rather than just the individual hacks so to speak, the individual things that you’ll do. Nathan: Right. This is more of a mentality than a tactic. Nathan: One of the first things that you talk about a lot is throw the marketing plan out the window. I think that’s a really scary idea but what I’m wondering then is how can a marketer create a really amazing content without a documented marketing plan? Garrett: Yeah, it is. It can be very controversial and every time I tweet something along those lines we’ll do in articles, there’s always these obligatory comment or reply that tells me that’s the stupidest thing they’ve ever heard. Again, it’s not that crazy once you start thinking about it because thinking about it is kind of really digging into what is a marketing plan exactly. When I speak of marketing plan, we’re generally thinking of this multi-page document that explains exactly what we’re going to do, what our audience exactly is going to be and how we’re going to convince them to buy something. We kind of walk through in the entire marketing funnel step by step and we assume a ton. You assume that every single thing that you wrote in this planet is going to work. You assume that you had all the knowledge you needed to have in order to write the plan. You assume that you completely understand your audience. You assume that you know stuff. My point is that, in particularly as a startup, when startup goes into business with that mentality they will be guaranteed to go out of business, 100% guaranteed. I think the same goes for marketing. If a marketing plan, if a marketing team goes into selling a product assuming that they know 100% of what they need to know in order to sell that product, they’re going to fail. They’re going to produce marketing that provides no ROI, guaranteed. The reason is because there’s just way too many variables there. It’s more knowledge than any one person can possibly have. You can’t 100% understand your audience or what motivates them. You can have definitely good ideas, good understandings, but at the end of the day at some point you have to acknowledge to yourself that you’re guessing and that you don’t know for sure. Does that makes sense? Nathan: Yeah that makes sense. I think what you’re trying to say too is creating content without a plan is not the same as creating content without a strategy. Garrett: For sure. I think the difference there is a plan means you take in the strategy and you spelled it out in very great detail and you written down like I said it’s probably it’s a multi page document. A strategy, I almost think of it as something more than just strategy. It’s a strategy you’re going to try. There’s something in startups called the Lean Startup Model. What this model does is it says okay, you’re going to have an idea of maybe for a new product or in this case a new piece of blog content or a new email marketing drip campaign maybe. What you’re going to do is you’re going to great something that is the minimum viable version of that idea. What I’m talking about here is actually taking your idea and rather that going full board and creating that big ebook, you actually figure out a way to do what’s called a Minimum Viable Product. What’s the minimum thing that you could publish and something that you can potentially do by the end of the day or the week that will allow you to get feedback on your new idea and see if it’s really worth pursuing. That’s the first phase of that Lean Startup Model. The second phase is measure. You have to say once I’ve done this, I publish something, how am I going to look and evaluate if it’s a good idea or not. A lot of that could just be let’s go back to this Facebook post like if the comments are positive or people are asking good questions. The questions may be indicators of how you can improve what you’re doing. If they’re not talking back to you, if they’re not liking it, that could be a signal that it’s just done something that’s very important to your audience. Whatever it is that you use to measure it, you then take it and you learn and you figure out how to improve upon your idea, your concept so that when you actually get to publish that ebook you’re going to do it well. Nathan: Yeah. Obviously, we use all those ideas ourselves so that makes perfect sense publish something iterate and then learn. Garrett: Yeah. I was talking about this recently and I used the example of this podcast exactly and I was applauding how you decided to go about launching it. We’ve hired somebody. You’ve contracted somebody to do the final editing, to help with posting it and getting our iTunes feed setup and everything like that. Before we even got that far, you actually recorded a few episodes in a raw recording mode and emailed them to a group of our audience just to get some basic feedback on the podcast, and also just to gauge interest. Before we even actually launched this thing, we’re actually starting to publish and send out podcast episodes, getting feedback on what topics matter to them and making sure that we’re doing some due diligence instead of just saying, “Okay, we know for sure that the product we need to launch here is a podcast. We know for sure that they want us to talk about these topics and we know for sure that this audience is going to care.” We kind of assume that we didn’t know everything and therefore caused us to launch ahead when they normally would. I think that’s the mindset shift, is that you say rather than what are we going to launch next to do perfect marketing? It’s maybe, what are we going to launch next so that we can learn how to do perfect marketing? Nathan: Yeah, that mentality is something that we ingrain not just in marketing but a lot of things around CoSchedule. I think that’s a really big part of our culture. What’s some advice that you might have for marketers who feel like something like that might not work in their company’s culture, what should they change? Garrett: A really good way to just change it is ask yourselves the question like what can I ship right now? I think it’s not as much about trying to change the culture all at once, I think it’s more about trying to prove a new method works one time. What’s the current project that you’re kind of sitting on? Maybe something you’re planning out, maybe it’s a new campaign, maybe it’s a new sister website. It could be a new podcast just like this one, like whatever it is. What can you ship tomorrow? What can you get out there tomorrow to start collecting feedback on that idea rather than just stewing on your plan? I think one thing about this is that marketers are really fine that by doing that and following that mentality. It actually makes the planning a lot easier because you’re collecting information as you go. It’s really stressful to come up with a guest for an entire campaign or blog post when you don’t know what the outcome would be, it’s a lot harder to do as you get more information will become easier and reduce your stress level. I think that transitions well onto a different point that we want to talk about. One of your ideas is that classic marketing question of what’s in it for me as a reader reading something, any piece of content, I’m asking myself always, why would I want to read this? How is that strategy, or why does it work so well? That’s the idea. How can your marketing be useful? We talked a lot about and we used to talk about it even more just as social media was kind of becoming more popular that it’s a less of an interruption base medium. TV, you’re watching a show that you enjoy and all of a sudden we interrupted you with an ad that’s usually louder that the show you’re just watching, it’s really frustrating. This mentality creeps online in terms of ads and stuff too more and more but what if marketing didn’t have to be interruption based, what if we could be add-value based? I think CoSchedule, your team, Nathan, does a really good job of this, is they’re always providing valuable tips, actionable resources, worksheets, info graphics that help customers be successful with the things that they care about. They don’t necessarily just sit around, we don’t just sit around focusing on talking about CoSchedule exclusively. I think it works well because it’s customer focused. Nathan: Those are all really great examples of some of the resources. Do you have anything else like a different example, something specific of how that sort of technique has worked? Garrett: Yeah sure, I have two. One would be outside of CoSchedule and we have a great post on the blog about this I wrote a while ago. I think we recently refreshed some of the content in there but just about Nike and how they got this start using a piece of content marketing essentially that was there to provide value for their potential customers and wasn’t a silly piece of content that was there to sell Nike. It was a book about jogging. I think one thing that really surprised me as I started to look into this was that jogging wasn’t all that popular. It wasn’t as just a normal part of everyday life like the way it is now that anyone of your co-workers or yourself may just go for a jog and probably does it a couple times a week. Back then, it wasn’t the thing that people did or wasn’t kind of a part of our culture in that same way. Bill Bowerman, one of the guys who started Nike, actually wrote a book about the benefits of jogging and why you should do it. He partnered with a cardiologist to get really good medical data on why it is an important thing. As we go along, this book was sold well, didn’t mention Nike at all. What it did is it popularized the sport of running and it made it so that you’d think of it now like what person doesn’t have a pair of jogging shoes? Everyone has a pair jogging shoes. There’s lot of them that are Nikes and over the year tons of them that are Nikes. They gave something away, this book on jogging, and people literally paid money for the book. They read the book and it helped create this cultural phenomenon known as jogging that we all take for granted today and it helps sell Nike. That’s a really cool example of how that can work. I think there’s tons of ways that a business can apply that but that’s one of my favorite stories. Some people that are familiar with CoSchedule may be really familiar with our headline analyzer which is a really good example of this as well. Headline analyzer, we did a bunch of research on what makes a great shareable headline. Nathan, I know you guys use it all time with the blog and talk about it but that tool is used by thousands of people and they come to it every single day, every single blog post they write, every single email they write when enter the subject line. They’re using it to make sure they’re writing really great headlines. It’s free, we put it out there. You don’t have to do anything to use it but it’s driven a ton of growth for us as a tool to drive our email list, our subscribers growth. It does help us. It’s a bit more indirect but more importantly it’s something that provides value to our audience. Nathan: Yeah. I like both of those examples, especially that Nike one. It kind of proves that this whole concept is old. Wasn’t that published in the 70’s or something like that? Garrett: Yup, published in the 70’s and there’s actually even older examples. I think Michelin Tires had a guide book on how to do maintenance on your car. I think there was something from Jello. It was also like a jello head a pamphlet on ways you could use jello. Nathan: That just kind of proves that this has been around for a really long time but it’s kind of becoming popularized now. Garrett: Well I think maybe another way to look at is giving your audience value never goes out of style. That’s always a good idea and a good thing to do. Nathan: Yeah. That’s a huge take away. Speaking of huge, something else I wanted to ask you about is something you say it a lot around the office is we need to be looking at 10x projects and not 10%. Could you explain to us what do you mean by 10x growth? True, you can write better headlines and that would help and that would be a 10% improvement. You might be able to increase your list size by 10%. What if we sent out one less email per week? Would people be more likely to sign-up because they’re not afraid to getting spam? No, potentially good idea but maybe only a 10% improvement. I think asking yourself the questions how do we grow our email list by 10 times? Or how do we grow or blog readership by 10 times? It gives you a completely different frame of mind like, 10x? Wow, we have a thousand people on our list, we need to get 10,000 people on our list. In six months, we’re really going to come up with something creative. It forces you to approach those projects in a different way and then what it means is that you’re going to be able to prioritize the things that you work on in terms of what brings you the most value, not the least. Not that 10% is bad, it’s just why would you 10% stuff if you could have 10x? Nathan: Yeah that makes perfect sense. I think that headline analyzer is a good example like you could publish a blog post with something to get an email address or you could make a tool that could help you get email addresses. Garrett: Yeah totally and it is definitely a 10x project. It has been a 10% growth lever for us for sure. Nathan: Speaking of some of those examples of 10x projects, do you have any others for me? Garrett: Yeah. I have a good one that’s content marketing related actually. There’s a company called Groove. I talked about this on the blog before but there’s a company called Groove that has a really interesting story. They’re startup that sells help desk software. Totally great customer for them would be CoSchedule ourselves. We use software to manage tickets that come into our or help desk all the time. Groove had a perfectly good content marketing blog. They had a blog that was I think they had 10,000 subscribers or something like that. It was going fine. They were getting a nice trickle of traffic and like said it was going fine and they were going making good 10x or 10% improvements. He made it totally public and then they started changing what they blog about. They were no longer blogging about support topics like, how to do great support? How to ask great questions from your customers? They moved into here’s how we achieve growth. Here’s how we did AB testing on our home page to improve sign-ups for 4 to 5%. Here’s what happen when we tries to raises a serious A round of funding and it didn’t work. Here’s what we did that made 10 customers leave instantly and it was a huge mistake. Stuff that guys like me, guys like you like we’re totally interested in those topics and we’re in their customer based. They actually started talking about things that were more on the peripheral I guess of their business but they still connected with the correct audience and it was a huge 10x growth. I think they grew their list by 5,000 in three or four days. I think they’re at 10,000 beforehand. That’s a really big improvement, very, very quickly and I’m sure it’s been 10x of 10x in terms of growth to that team over the long term. Nathan: Yeah, 50% growth in just a couple days is definitely a 10x project. It’s kind of easy for us to identify what a 10x thing would be. How would you recommend that someone, let’s say they’re in a company and they’re asked to do a 10% sort of project, what should they do? Garrett: They’re being asked to make 10% improvements and they want to do a 10x thing instead? Nathan: That’s where I’m going, yes please. Garrett: The culture of their company has to do a little bit but sometimes I think, I might just say do it anyway. Do the 10x, don’t ask for permission because 10x growth, you’ll get forgiven probably. That’s probably a good way to think about. There’s this other idea in the back burner that we’ve been kind of sitting on and I think it would probably bring us like 5,000 or 6,000 more subscribers. I just kind of wanted to see, could we get more resources to this? I think if you approach it like that, you might get pretty good results. I think it’s probably pretty common I think for marketing teams to get sort of stuck in 10% mode. If you can find ways to bring your team out of that, that’s what’s powerful. I think for us it’s always asking that question, is this a 10x project? Like we asked that question sometimes, is that a 10x change? Figure out how to make that a part your everyday culture and I think it will change the way you think about everything. Nathan: Yes sometimes just the simple question can be a really great framework for success. Nathan: My last question for you Garrett is that just because we’re on the topic of 10x, what’s CoSchedule’s next 10x project? Garrett: Oh wow, I see. Okay, now was this question on the note? Nathan: I may think sneak this one in on you. Garrett: I’d say we have a lot of them and I say one thing that’s interesting to me is as we get a little bit bigger and we have more and more teams, it gets harder and harder actually to distinguish from 10% projects and 10x projects partially because there is a need sometimes to do 10% projects. There are certain features for example that are users are like, “Hey, I really like this task feature but it would be a lot better if it just did this one thing.” That one thing is going to be a 10x improvement for them but for the growth of the company it’s probably just a 10%. I think the complexity of balancing that all the time becomes more challenging. On the product team, we have several teams. We have five teams and we have about half of them or more than half probably focus on what we consider 10x projects. Things than help our users do more measuring for example of the content and social media messages that they’re publishing so they can get better at what they’re doing and provide proof to their employer’s ROI. For us, that becomes a 10x project and for our users that’s also a 10x improvement. That’s a really good example of a win-win. We try to find those as much as possible but you kind of have to find a good balance. Not every single thing you’re going to do every single day is always 10%. You try to find some of the key things that will do it. Hopefully this podcast is with a potential 10x audience growth for people who want to digest our content in different ways by audio rather than written. We also have a video show in a works and we think of that as a 10x projects. It’s got slightly different goals than just audience growth but in the long term we see that as a 10x growth lever too. Lots of different things, it never really stops. It just sort of changes a bit in terms of the context of your business. Nathan: Yeah I think that’s all really great advice. Garrett, thanks. I know just for me it’s been a lot of fun to be a part of the growth that we’ve experienced at CoSchedule in so fast. I think a lot of it has to do with the way that we’re managing projects, the way that we’re looking at strategy, thinking of our audience, always prioritizing these 10x things, I’m really excited to see where we’re going to go from here. Garrett: Yeah. I want to actually end this show on one phrase, I’m going to turn the tables because this is actually a quote from you. 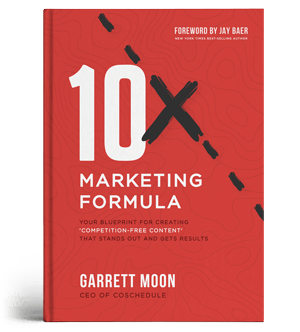 You say, “10x means that your team is 100% focused on the projects that produce repeatable, measurable results.” I think that’s a really, really the key item. You did a really good job on your team of communicating that over and over again. I think to bring it full circle, content hacking, thinking like a startup, it’s a mindset shift. Teams that are willing to think big, think in terms of 10x and that are willing to learn as they’re doing it and get better rather than making detailed plans, that’s a culture that’s willing to win.